Protecting life and property by providing the most effective emergency communications possible for the residents and visitors of Monmouth County. Providing county public safety field personnel with professional communication services with emphasis on safety, accuracy, and cooperation. Providing the community with public service in the form of senior citizen education, career days for youth, volunteerism in community programs, support of charitable organizations, 9-1-1 education programs and other programs that benefit the community. Working cooperatively with the public, our partners in public safety agencies and governmental agencies, employees will strive to improve the quality of life for all residents and visitors of Monmouth County. The Communications Division is made up of more than 100 9-1-1 Telecommunicators and a number of staff in the Information Technology and Radio Communications. 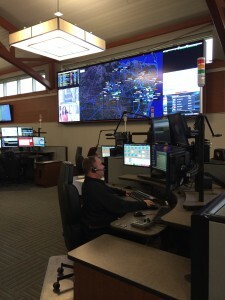 The Monmouth County 9-1-1 Communications Center, one of the largest in New Jersey, provides a high level of 9-1-1 services to 44 municipalities, dispatches for 20 police departments, 59 fire departments and 31 first aid squads. The communications division also operates two mobile command units (Field Comm), that respond to large scale incidents and events throughout Monmouth County.